My friend Courtney is one of my running inspirations. We met at work, and she started running about a year and a half before me, just blasting off. When I saw how healthy she was getting, how gorgeous, and most importantly, how much happier she seemed after she started running, I knew I had to try it. We don't run together nearly as often as I'd like to, but I do think of her as one of my running buddies, and I ask her for advice constantly. When I first started, one of the first things she recommended was that I go to JackRabbit. And now, I want to share that advice with all of you. 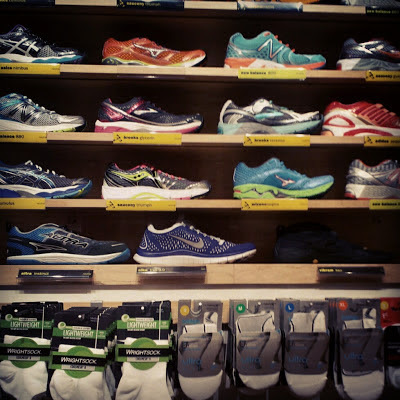 It's rare that I go to a specialty shop for anything, but JackRabbit really made me a believer, at least for running. When you go to try on shoes, they video tape your feet as you run on a treadmill to make sure that the shoes are working with your stride, and correcting it where necessary. The salespeople are always super-helpful, and offer honest advice about which products work and which don't. I was fitted for shoes for the first time in December, and Roger got his first pair over the weekend, and we both had really excellent service. 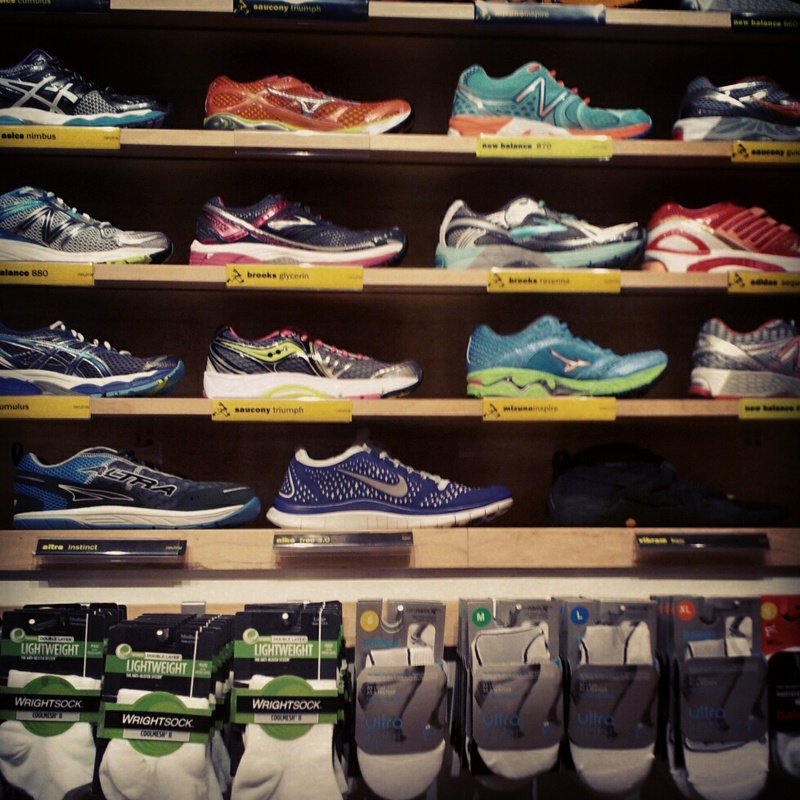 I went with a pair of Mizuno Wave Inspire 9, and Roger got a pair of Brooks Adrenaline GTS 13. I'm completely happy with mine, and while Roger's still in the trial-period with his, if he decides they're not quite right, JackRabbit will let him exchange them for another pair within two weeks (so long as he doesn't go nuts and run through a giant mud-trail or something like that). Their return policy for shoes is really generous, and they also have a shipment system, where you can have shoes over-nighted to your house or office, if you don't need to be fitted. Of course, they have a wonderful array of other products, and while I tend to get my active-wear from Old Navy or at shopping outlets where they're a little more affordable, I have bought quite a few accessories from them, including a water-bottle with a special handle for carrying as you run, and some really great headbands. Once I start doing my long runs this spring, I know I'll buy my gels and perhaps some other gear from them as well. Perhaps my favorite thing about the store, though, are the activities they run. Every year, they have a New Years resolution kick-off, where you can sign up to receive a free tech-shirt if you meet your goal. They have tons of lectures during the year with runners, sports-medicine experts, and nutritionists. And although I haven't taken advantage of them as much as I'd like to, they also have group runs from all of their locations, and free yoga and pilates classes. They really seem to care about creating community here, and I definitely appreciate that. One of my favorite things about running is the fact that you can do it with pretty few start-up costs. I started with just an affordable pair of Vibram five-fingers and sweats, and I ran like that for over a year, with no problems. If you haven't been running, you can start out now, too! That said, now that I'm upping my mileage, I wanted something more supportive and padded, and knew that JackRabbit was just the place for a high-quality pair of shoes. So, if you're in the market for some new gear, or you're looking for someone to run with, or you just want to learn something new, JackRabbit's the place for you! That's great! I have gone through periods where I LOVE running, but if I take too much time off it goes away. :( I am just now getting started back up with working out at the gym...once it gets warmer I am definitely planning to run around the lake near our house! Having a place to run near your house makes it so much easier to force yourself to go! We have two parks really nearby, and a bike path on the river just a little further, and it's definitely encouraged me to get out there. I'm also ready for a little bit of spring weather - it's been FREEZING the past few days!